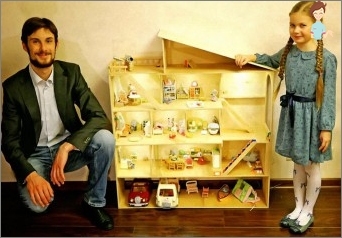 How to make a doll house from a shoebox, paper and wood with your own hands? Home / Needlework How to make a toy house for dolls? 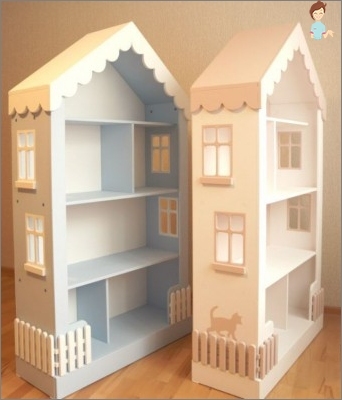 How to make a toy house for dolls? A rare girl does not like to play with dolls. 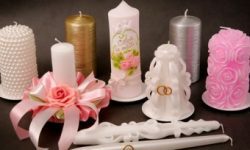 Today there are a lot of them, as well as a variety of accessories for them in the form of furniture, animals, clothes and everything else. Playing with dolls is a kind of rehearsal for an adult life that every future mother and housewife must undergo. In order for this experience to turn out to be colorful and full, parents need to take care of that the daughter had everything necessary, in particular, a house for her toys. It is clear that such a structure can be bought inAny children's store. 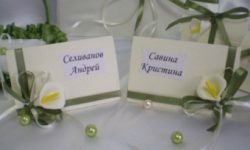 But, sometimes its price exceeds all permissible rates, and the appearance and functionality still does not satisfy the small hostess. 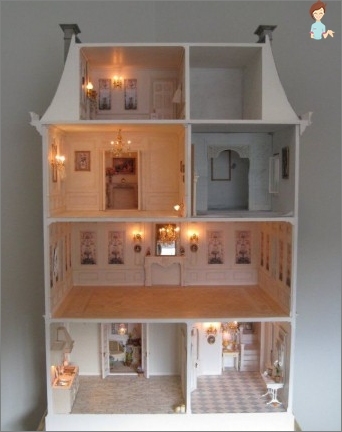 It remains one thing to make a doll house with your own hands. Do not be afraid, there is nothing complicated or expensive in this. Do not believe me? Then we recommend that you read this publication. Almost every Soviet house had shelvesFor books, consisting of several tiers. Today they were either thrown out or nailed in the garage. So, it's time to make a home for your favorite daughter's doll. The rear wall is also made of thin plywood. Now it remains only to wonder how to make a house for all dolls "Residential". For this, the "Floors" Glued pieces of linoleum or wool, which will mimic decorative floor covering, arrange shop furniture or its home-made option, hang curtains and so on. If the house has an unnecessary locker orBedside table, then the problem of how quickly and inexpensively to make a house for dolls with their own hands is solved very simply. The furniture is updated with a self-adhesive film, cardboard partitions are placed inside it, separating rooms for different purposes, and an interior interior is formed. Such a house for dolls is convenient because the frontThe wall in it is represented by two / one doors, behind which one can not see that constant toy disorder, which so makes parents nervous. When the child grows up, the handicraft can be turned back into a place for storing books, notebooks and other supplies. 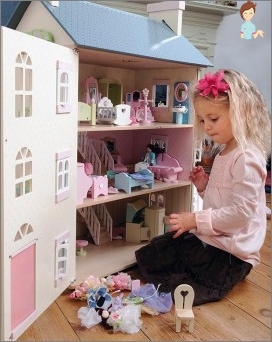 Even easier is the option of how to make a toy house for dolls from a cardboard shoebox. Two cardboard boxes: small and large. Then it will only be necessary to fill the roomFurnishings and by the inhabitants themselves. By the way, rooms can have different functional purposes, and in the house it is really possible to allocate a bathroom, a living room, a couple of bedrooms, a kitchen and a hallway. Everything, it remains only to fill the house with furniture and dolls. If you have a total lack of space in your apartment, and you want to please your daughter, we offer you the option of making a transformer house for several dolls. Then the construction should be cut and pasted so that the former box quickly and easily became flat. You got a general idea of ​​how to make a house from paper-Transformer for dolls. It is convenient in that it decomposes in a few seconds, and when folded, it fits perfectly behind the wardrobe or in any free slot. It is not difficult to guess how to make a bright and colorful felt-house-book for a doll. It should only be done differently (like the pages of a book) "walls". 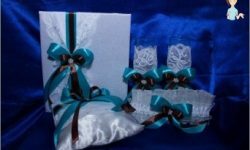 This is extremely interesting andMultifunctional hand-made article, which is sure to please your daughter. She can carry it with her like a regular book, and play when the appropriate mood appears. We hope that our tips will help you brighten up leisure with pleasant and useful pastime, socializing and playing with your child!